I think everybody got spam emails from unknown senders, you can see many drugs, marketing sells, pron, and other mails in your inbox. How can we know where these spam mails from? Actually, experienced users know how to check email header, you can find sender's real IP address inside. But for regular users it might a little bit hard, because it has several sender addresses. Yes, if we use an online tool to do this job it should be much easier than before. 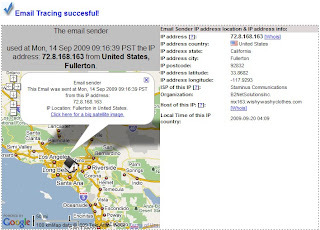 Email Trace is an online tool that from IP Address, it gives you an easy way to track email trace. Just copy and paste email header into a form, click "Trace Email Sender" button, it will show you sender's IP address with Google Maps. It is a useful tool to check sender's IP address.